Florin SZIGETI brilliantly finishes his musical studies in the National Music Conservatory, being awarded the First Prize for Violin as well as for Chamber Music, and won the First Grand Prix of the National Violin Contest in Bucharest. Florin SZIGETI is a founding member of the prestigious ENESCO Quartet , with whom he settled in France, in 1979. With the Quartet, he won the First Grand Prix of the International Chamber Music Competition in Paris, and was awarded the Grand Prix du Disque , followed by several Diapason d’Or and Choc de la Musique for their recordings whose fame goes beyond the frontiers. With the Enesco Quartet he is regularly invited to play in major festivals and concert halls all over the world. Professor at the Conservatoire à Rayonnement Régional – CRR de Paris , Florin SZIGETI also teaches at the Conservatoire National Supérieur de Musique – CNSM de Paris , leading at the same time a rich artistic and pedagogical career. 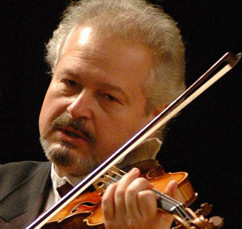 Recitals and concerts as a soloist, four decades as a “Concertmaster” of chamber and philharmonic orchestras, as well as more than two thousand string quartet concerts mark Florin SZIGETI’s musical career. A highly esteemed teacher, Florin SZIGETI is regularly invited on jurys of international competitions and for masterclasses in France, Belgium Germany, Spain, Finland, in the company of the most celebrated international musical personalities.